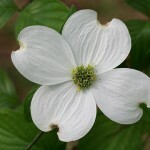 Today, I am going to write about one of my favorite flowering trees. This plant has bright white Spring flowers, stays a nice compact size that fits almost any landscape. It also has an interesting bark color. It is hardy in zones 4-8 so you can grow it almost everywhere in the US. Sorry Northern Minnesota and southern Florida, your left out of this one. No, it’s not a crabapple. 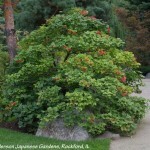 It’s not a redbud. It’s also not even any of the dogwoods. It’s a North Star sour cherry. The North Star cherry or Prunus cerasus ‘North Star’ if your speak Latin. It’s best trait is one I have not mentioned yet, it’s edible fruit! North Star Cherry tree with fruit ready to pick. This is a very cold hardy variety of sour cherry that only grows to about 12 feet tall and wide. 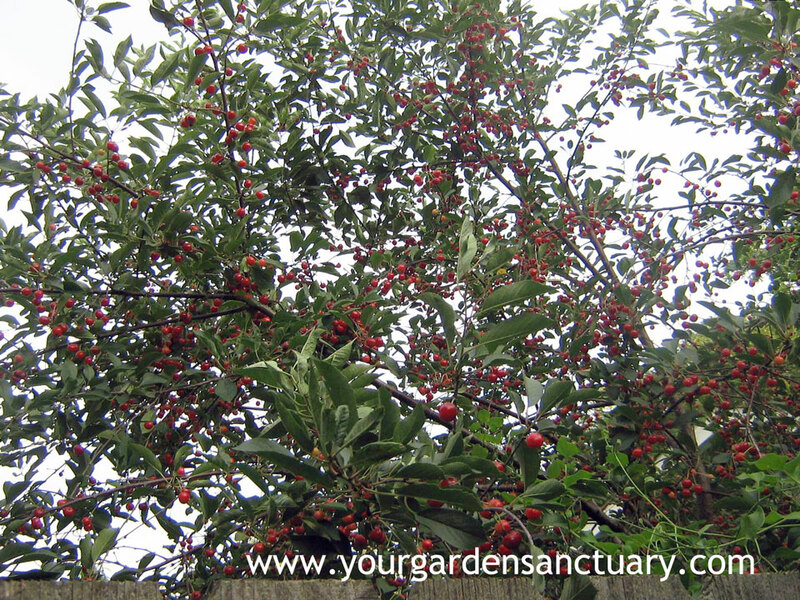 This is very good sized small fruit tree that fit into most yards that have a sunny spot for them. It is self pollinating, so no other tree is needed to pollinate it. It is not a sweet cherry, which tend to be much harder to grow in my Zone 5 area of near Chicago. 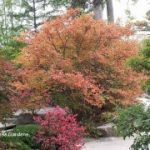 It also tolerates a wider variety of soil types than Sweet cherries (Prunus avium). It’s native to Europe and parts of Asia but is not invasive. 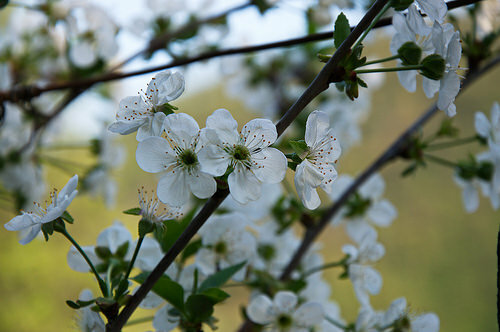 It is closely related to the sweet cherry, but it’s fruit is more acidic. It also has more nutritional benefits than sweet cherry. 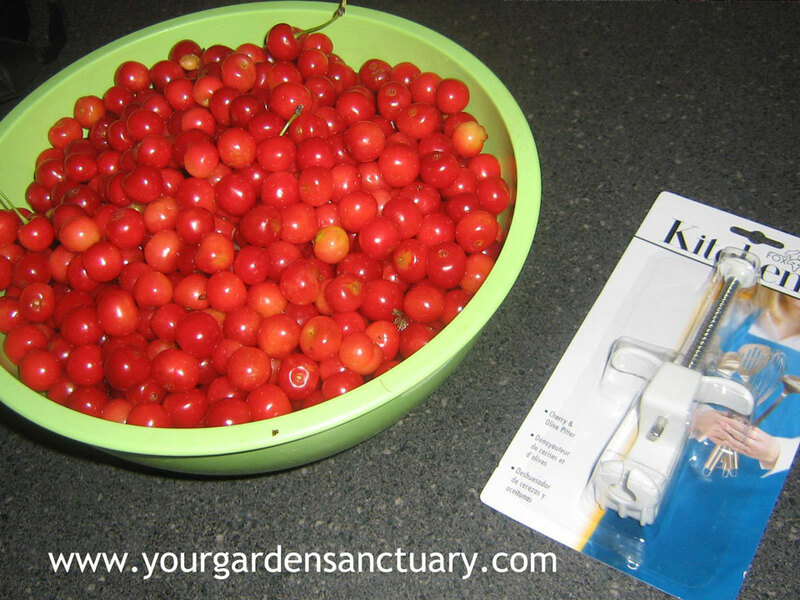 I never sprayed my North Star Cherry for any insects or diseases. It did get a little bit on black knot on it’s rootstock one year, but it grew out of it and needed no action on my part. Birds will eat the fruit but once mine started producing, the birds didn’t even make a dent in the amount of fruit I got off of it. Besides, I don’t mind sharing. If you want all the fruit, this tree stays small enough that you can net it pretty easily and keep the birds away from it. 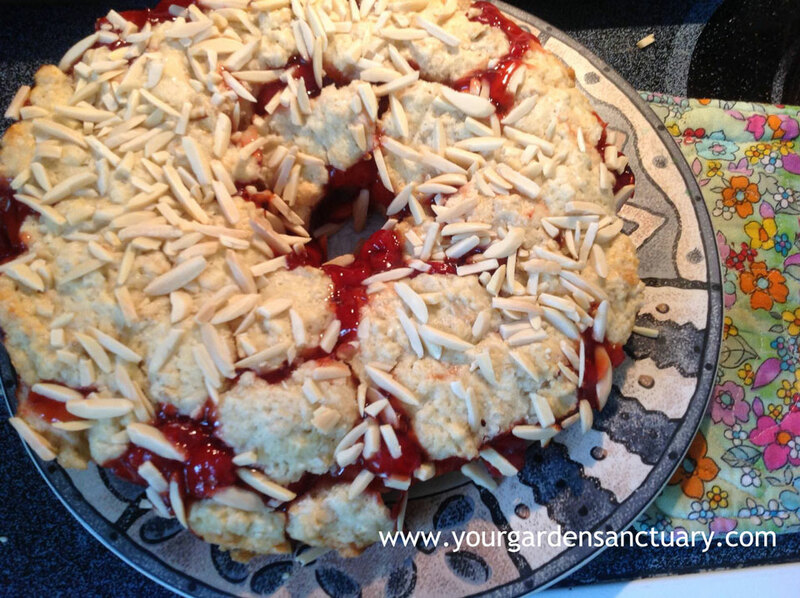 Sour cherries are also called “Pie” cherries as that are what they are most commonly used for. The best pies I have ever eaten was one my wife Jenny made from these and I have eaten a lot of pie! They are also very good in other desserts. Doesn’t that look good? It was! But don’t let the “Pie” part fool you, you can eat these fresh if you like a tart flavor and don’t mind spitting out the pit. My favorite use (besides pies) was to dry them using my food dehydrator and eat them as a snack. I did try both sweetened (by using soaking in sugar water) and unsweetened and actually found the unsweetened ones were plenty sweet. They taste a bit between a dried cranberry and a dried sweet cherry. You do need to pit North star cherries before you can use them in desserts. Having Fruit trees, especially ones you don’t have to spray nasty chemical on, can be fun family entertainment. If you are interested in planting a North Star Cherry, you can find them right now at some Big Box stores (I actually saw them at my local Walmart) or you can buy them bareroot from a nursery such as Stark Brothers. My Favorite part of having fruit trees is the memories you can make. 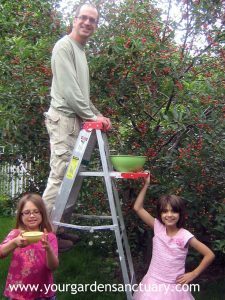 Here are three dorks (well four if you count the one taking the photo) picking cherries from another time. 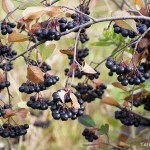 Red vs Black Chokeberry, which is better for landscape use? Full sun, the more the better. I would say you probably need 6 or more hours of bright direct sun (towards the middle of the day). Is it self pollinating or do you need both a make and female specimen? I should have noted it in the post, but it is self pollinating, no other tree is needed. For Northern Minnesota – and other cold climes – I can heartily recommend the Evans cherry. We grow it and get wonderful sour cherries in southern Alberta. It stems from a cultivar found in Edmonton, Alberta, and it is plenty hardy. There are also new cultivars of sweet cherries (the Romance series) developed in Saskatchewan and they are quite successful in 3a (and delicious). I like the Evans cherries fresh but for those for whom that’s too sour, I’d recommend Juliet, Romeo, Cupid, etc. from the Romance series. Hi—I’ve had a North Star cherry in the orchard for about 5 yrs. now, without any winter dieback, and I am in northern Wi., zone 3, where many plants don’t survive our winters. Better producers, and just as hardy, are Montmorency “supermont” and Meteor. Sure you could plant it in potting soil and hold it for a year. You will just need to keep it watered much more frequently than if it was in the ground. If you forget it for a few days in the heat of summer it could be toast. You could also plant it at some ones yard and transplant it next year.